Gallery of some of the other wildlife found on the wildlife reserve. All the photographs are taken on the reserve. Bees collecting pollen from garden Sunflower. 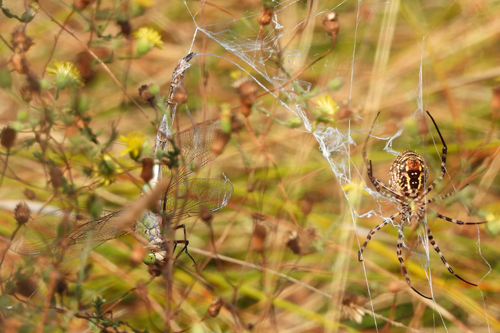 Banded Garden Spider. Argiope trifasciata. Cinnabar Moth caterpillars feeding on Common Ragwort. The plant is poisonous and gives protection to the caterpillars when they eat it so that predators avoid them. The bright yellow and black stripes are warning colours to ward off potential predators. An Orb-Web Spider. Probably a Lobed Argiope (Argiope lobata). Just below the spider is a zig-zag-shaped silk decoration known as a stabilimentum. This is highly characteristic to this genus of spiders. The function of the stabilimentum is much debated, but so far remains unknown. Lobed Argiope spider with its Wasp prey wrapped in silk. Bumblebee drinking nectar from Wild Radish. Shield Bugs mating (Graphosoma italicum). Bee collecting pollen from Smooth Sow-Thistle. Bug on Bucks-Horn Plantain flower. Beetle on Purple Milk Thistle. 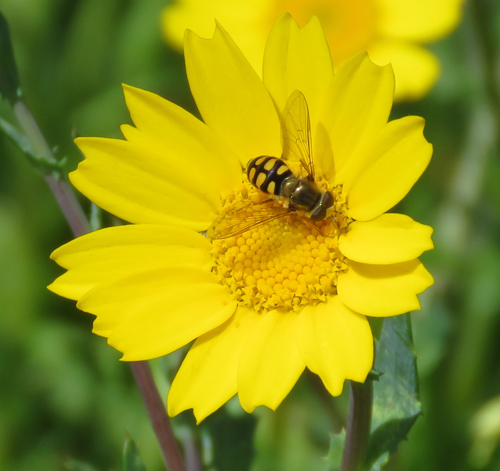 Hover Fly on Corn Marigold (Mosca das flores). Crab Spider on Star of Bethlehem flower.